The note that appeared in the February issue of the VMCC Journal has come up trumps! We have been joined by a Sopwith Camel afficionado, a Bentley Boy, and a Historical Battle Re-enactor, no less! But ABC enthusiasts one and all, I welcome them to the membership. The Pegged Lockplate puzzle has now been elegantly solved by our ex-ABC Marque Specialist Alan Redman, see his photo below: clearly (?) the lockplate is located by the upper of the two bevel-box through-bolts. Whilst on the subject, Gnome et Rhone adopted a different approach to this part of the machinery: instead of the output shaft bearing being carried in a large threaded ring, it was mounted in a cast plate, solidly nailed to the bevelbox by eight studs! 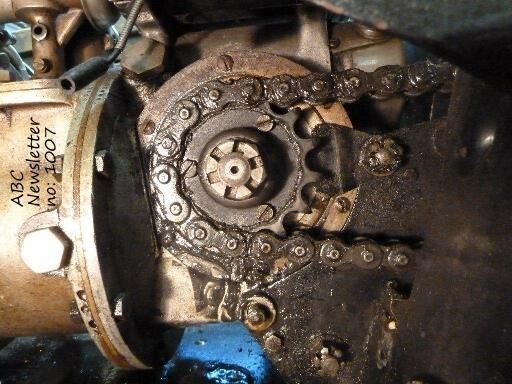 How adjustment of the bevel gears was achieved is not immediately clear however. This is all about a written article on an ABC machine. 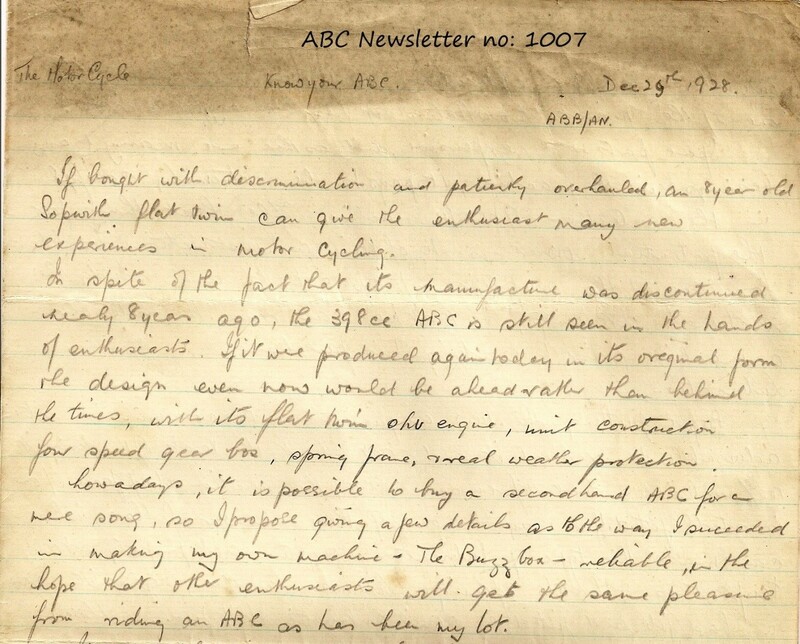 Accompanying my basket-case Sopwith (in Feb. 2011) was a collection of old photos and documents, one of which was a pencil-written manuscript on foolscap paper that ran to nearly seven sides (see partial copy below), entitled, Know Your ABC. The heading additionally included the words The Motor Cycle, and Dec. 29th 1928. Aha, thought I, this is clearly a pre-Xerox copy of an article from The MotorCycle magazine. The writing was legible except for one or two words: the next time I was in the VMCC HQ library, I looked up the relevant magazine to check the wording, but was puzzled to find that 29.12.28 was not a publication-date for The MotorCycle. A search through issues on either side of this date, and of MotorCycling, revealed nothing. At a later date I came across an excerpt from what was clearly the same article, in Part 3 of the Les Taverner series on his ABCs in the VMCC Journal (April 1989, page 171). Les referred to a complete serialisation of the article in the Journals of Aug/Sept/Oct. 1949, and ascribed it to Torrens, the pen-name of Arthur Bourne, sometime editor of The MotorCycle. A little cryptically, Les added that "The Torrens article was never (apparently) printed in The Motor Cycle, but came into the Vintage MCC Bulletin editor's hands - how? It would be nice to know". One agrees! The more so, that on my next trip to the library, inspection of the 1949 version showed it to have significant differences to mine. Many words and phrases differed, and some sentences had been completely deleted. Which was the older/truer/original version? "1949" seemed to bear the character of some quite strong editing from an earlier version: could that make my edition an original Torrens manuscript? Exciting stuff! Do we have a hand-writing expert in the Membership who was familiar with Arthur Bourne? More to the point, perhaps, is that anyone who'd like my typescript copy of the manuscript is welcome to apply. This 'n That…Martyn adds a reminder to my Switching of left and right hand Cylinders (Newsletter No. 1006), that there was often an oil-feed hole in the top inner-end of a left-hand cylinder. He also recommends the use of thicker connection-flanges at the 'head-ends of the inlet manifold, as the originals, at only about 11 gauge, were apt to deform under over-tightening onto Hallite gaskets. John Emanuel considered the suitability of Honda (any port in a storm!) GX 160 pistons, as possible replacements for Sopwith components: the principal properties of these (industrial engine) parts seemed OK, but nowhere could he find detailed dimensions. Does anyone have a Piston Catalogue that could decide the matter? Keith signals that the tentatively-proposed Reunion Meeting at Brooklands later this year, seems to be off: 2014 turns out to be the Centenary Year of the Cotton marque, and they've secured our date! Positively, however, Keith thinks he's found a source of 'O' rings that could be suitable replacements for the sealing-rings in our Sopwith petrol- and oil-caps. This is part of the 'title page' of "Know Your ABC" referred to above. Barn-fresh, as they say, from the Alan Redman dossiers, this photo illustrates the exact location of the elusive Pegged Lockplate. Circulation of this Newsletter is 23. The updated Membership List now stands at 16, and is included to those of you who appear on it.I appreciate that some ABC Enthusiasts may have good reasons for not wishing their credentials to appear on the Membership List. If you are one such, please let me know of this: otherwise, you will be scratched from the Circulation List.